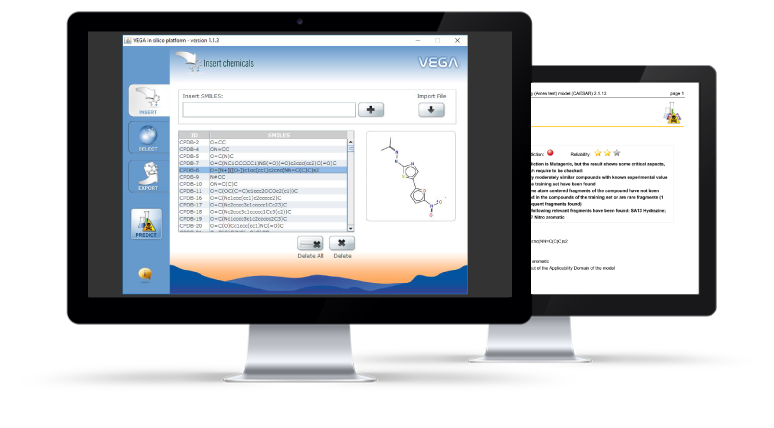 VEGA provides tens of QSAR models to predict tox, ecotox, environ, and phys-chem properties of chemical substances. With VEGA you can get a clear measurement of the reliability of the prediction, and also visualize the most similar compounds of your target substance, for read across assessment. VEGA has been used by ECHA to identify substances suspect to meet Annex III criteria for REACH. ToxRead is a software to assist user in making reproducible read across evaluations. ToxRead shows the similar chemicals, structural alerts and relevant features in common between chemicals. JANUS expands the prioritization for PBT developed previously by the project PROMETHEUS. The Prometheus application provides an overall PBT (persistence, bio-concentration, toxicity) assessment based on QSAR modelling, combined in a final score useful for ranking compounds. A preliminary BETA version is available at request. ToxDelta nicely complements ToxRead. ToxDelta keeps into account the differences, and thus the dissimilarity features. ToxDelta is a program which identifies the differences between two substances, and if these differences are related an increase or decrease of the effect. It nicely complements ToxRead. While ToxRead identifies the similar compounds and the common structural alerts between the target and similar compound, ToxDelta keeps into account the differences, and thus the dissimilarity features. A preliminary BETA version is available for download.